Cold milling machines have been ripping up old road surfaces since 1950’s! flat surface milling machines have been used to achieve the best outcome in most hard surface milling situations, starting with tow along milling machines and improving over the years to get to the mobile Cold milling machines that you can see in the picture adjacent. With a quick, powerful and cost reductive set-up, they have been found to mill surfaces across airport tarmacs, race track’s bitumen and all road type surfaces. when you got a machine doing this kind of work, you need the right tools to service the machine! The Rad 10 GX has been a valuable tool on the market for quite some time now, covering a vast array of jobs where the right torque needs to be applied. the Rad 10 GX is accurate to 4% with a repeatability of 2% and a traceable certification to NATA. Pneumatically Powered, this tool is quick to reach its set torque, without impacting the application and stalls on completion. Recently A company, Alpha Milling, in the USA had to service one of the large cold milling machines. 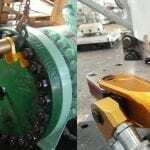 this process involves inspecting and repairing or replacing the teeth on the milling drum. due to the high load that the teeth come under in operation, it was required that they torque their teeth holding bolts to a value that your average air tool could not possibly deliver. how were they to achieve their torque in a quick and accurate fashion? The question was on the table and the Rad 10 GX answered it! The RAD 10 GX was quickly set to the pressure needed to gain the torque on the bolts. with the robust reaction arm in the picture you can see the task was easy to set up, ensuring maximum comfort for the entire duration of the job. With the teeth bolts all torqued up, the mill drum was ready to get back to work, the companies service time on the mill drum was reduced and the lifetime of the teeth extended! This is only one story of the RAD 10 GX improving servicing and bolting applications, find out more at our website (www.radicaltorque.com.au) and how our tools can save you money and time!